CHRIS Newton (North Wirral Velo-Kodak) continued in a rich vein of winning form with overall victory and a stage success in the British Sugar two-day Chairman's Silver Spoon Chase road race in Nottinghamshire. Despite the counter attraction of the Welwyn-Hatfield Grand Prix, and Premier Calendar points, the Newark Castle CC event attracted a field which included 58 first category riders. Newton ran out winner by just 11 seconds over Wayne Randle (Optimum Performance RT) after 144 miles' racing in three stages, with Randle's team-mate Kevin Dawson almost four minutes down in third place ahead of Jeff Wright (North East RT) and North Wirral pair Peter Longbottom and Simon Lillistone. First blood went to Optimum Performance as Dawson stormed home two seconds clear of Newton with his time of 3-18.5 over a windswept 1.5-mile course for the prologue time trial. But, with four riders in the first seven, it put North Wirral in the driving seat as far as the team battle was concerned. Two hours later, with the rain by now pouring down, the 76 riders had to be persuaded to leave the shelter of the race HQ to tackle the 58-mile second stage. With two punctures in the neutralised section and no sign of a break in the weather, the service crews led by former professional Dave Miller were destined to have a busy afternoon. There was a break almost from the end of the neutralised area, but the field came back together and they sped through the finish area at almost 40mph in one long line. A mile later, on the climb to Kneesall Woods, Pete Coggins (Brough Wheelers) forced a split with Ian Mountain (Irish Heritage CC) and national grass champion Pete Kennedy (East Midlands Division) for company. They opened up a 25-second advantage, but on the next lap Wayne Randle and Paul Jennings (North Wirral) had crossed the gap to make five at the front, followed by a further five - including Kevin Dawson - to give Optimum Performance two men in the break to Wirral's one. With everyone in the break working, the lead grew to a maximum 41 seconds on the fifth circuit, but by the end of that lap the race radio reported that several small groups were in hot pursuit. On lap six, with 42 miles covered, Jeff Wright, Martin Pitchford (Brough Wheelers), Jeremy Harrison (South East Midlands Division) and Simon Bray (Team Energy) made contact. But on the narrow lanes a 17-strong leading group proved too unwieldy and the lead dwindled, allowing several other riders to jump the gap including North Wirral pair Chris Newton and Pete Longbottom. At the same time the fluctuating pace saw some of the early animators lose their places at the head of the field. 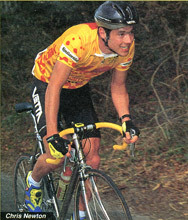 Despite several furious attacks from Pete Coggins in the final miles, a group of 12 contested the sprint with Newton reversing the morning time trial result when he beat Dawson and Wright. With time bonuses, Newton and Dawson would start the third stage as joint leaders, but North Wirral now had a three-minute lead in the team classification. Sunday's 85-mile final stage started in bright sunshine, but within three miles chief commissaire John Wilson had stopped the race to lecture the riders about crossing double white lines in the strong crosswinds. As soon as they restarted Paul Jennings jumped clear, taking with him three others, and although they gained a lead of 41 seconds a group of 10 riders had caught them by Hockerton after 12 miles. The group now included Mark Lovatt and Wayne Randle (Optimum Performance), Pete Longbottom, Paul Jennings and Chris Newton (North Wirral), Ian Mountain (Irish Heritage), Mark Dolan (Army CU), Andrew Whitehead (BCF West Yorkshire Division), Simon Bray, Richard Hobby (VC Lincoln), Pete Coggins and Alec Harrison (BCF South East Midlands). The group grew to 18, and as the 35-mile mark was passed Longbottom could be seen encouraging everybody to do their turn at the front. Martin Pitchford, who had joined the group at 27 miles, tried a lone effort, but on the long, open road he never gained more than 12 seconds. Simon Lillistone was first of the chasers to close the gap to the lead group, putting all four North Wirral riders up there. Then came Kevin Dawson, Jeremy Harrison and Paul Wilkes (Dinnington RC), and as they approached the finish line with just over 50 miles covered a further six riders joined the break which was now larger than the main field. Seizing his opportunity, firstyear senior Richard Hobby attacked on the headwind section out of Wellow to be joined by Randle and Newton. As they swept through the twisting lanes near Eakring they were quickly out of sight of the break and within four miles had opened a gap of 45 seconds. Sharing the workload, the trio stretched out a lead of 1-35 with less than 20 miles left, and with North Wirral working to defend their leader the overall result was not in doubt unless Randle could take a 16-second lead over Newton. As they took the bell Hobby was clearly suffering, having ridden his heart out, and as Randle climbed out of the saddle on the rise into Eakring the Lincoln rider slipped off the back with 12 miles remaining. On the twisty descent through the village he found fresh reserves and fought hard to regain the leaders as Randle looked over his shoulder, but with Randle and Newton sharing the pace Hobby was hanging on grimly, taking on food and drink. His salvation was to last only a few miles, and the two leaders shared the work equally almost to the 200-metre flag. In the slightly uphill sprint Randle won by a length, but Newton was happy with his second place for an 11second overall victory. The chasers had Hobby in sight on the run-in, but the brave youngster held on by 16 seconds for third place on the stage. Team.- North Wirral Velo 17-12-20.